UNARCO pallet racking is available in both roll-formed and structural rack, and the most basic of components of every pallet rack or warehouse storage system include the upright frame and shelf beams. Pallet rack can be as simple as that. An upright frame has two columns connected by bracing that runs diagonally and horizontally. The pallet rack upright posts are punched with holes in the shape of a keyhole (interchangeable) or T-Bolt shape for beams to lock into. Interchangeable pallet rack is adjustable on 2” vertical centers and T-Bolt racking is adjustable on 3” vertical centers. An upright frame has at least (2) baseplates used to anchor the pallet rack to the floor for stability. The size of the baseplate is based on seismic forces and the loads placed on the pallet rack. 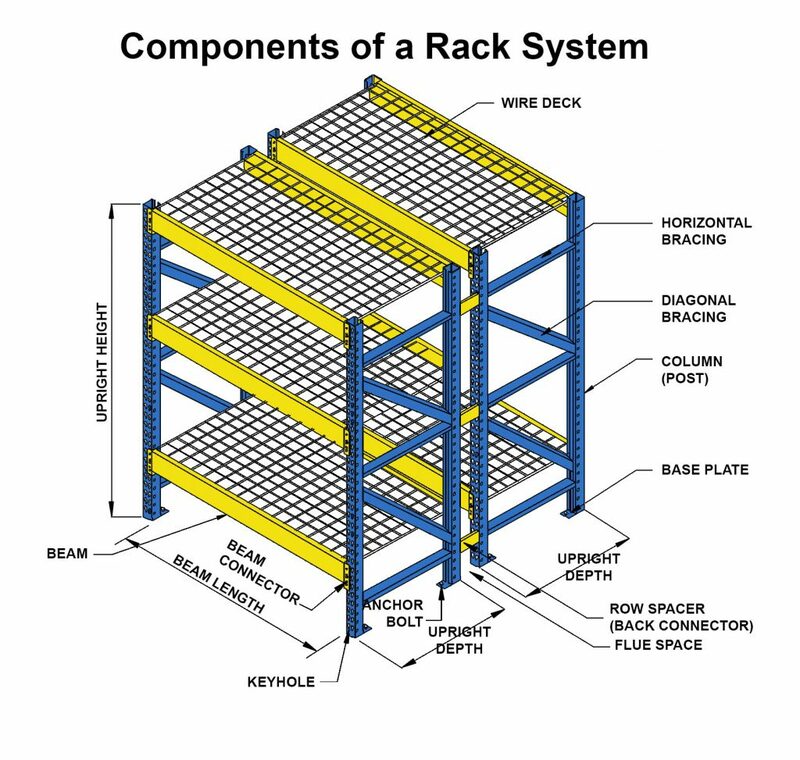 Engineers should check the design to make sure the proper baseplate is specified for the pallet racking. Shims are used to level the rack into plumb tolerance on warehouse concrete floors and should match the size of the upright baseplate. Two pallet rack beams with a connector on either end are required to form a shelf. Crossbars help support pallets between the beams. Typically two crossbars are used beneath each pallet load. For a more solid support of pallets, wire mesh decking is used to prevent pallets or the products from falling through the rack structure. Wood decking (stickers) such as a 2×4 or 2×6 can be used for product support. Row spacers are used for back-to-back rows to provide a flue space and give the pallet racks additional strength and steadiness. (Post Protectors) (Straddle Protectors) are bolt-on accessories that help shield the upright to minimize damage from forklift impact. See durability add-on accessories. End of Aisle Guards are either bolted to the racking or anchored to the floor to help prevent damage at the end of the aisle. Pallet racking is required to be anchored to the floor. The size, type and amount of embedment of the bolt is determined by local building codes or seismic engineered design. For more photos of Pallet Rack view UNARCO Pallet Rack Photo Gallery.